If quality Piano lessons are to be taught, students should be provided with quality pianos. Rocky Point Music School is equipped with instruments of the highest quality for our students including both a Yamaha and a Beale acoustic piano and a Yamaha Clavinova CVP-305 digital piano with weighted keys. As many of our students continue piano through to higher levels, it is imperative that we have instruments that can handle this high level of education. These instruments are used for our individual lessons. 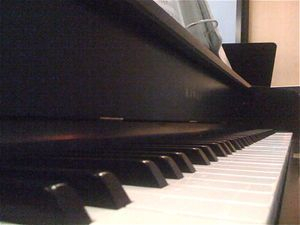 A quality Casio WK1600 keyboard with touch response is also provided for our keyboard lessons. Whether a student has a piano or a keyboard our teaching method is the same. We teach the full foundations of music; reading, ear training, theory, sight reading and repertoire. We teach both Classical and Modern styles and feel it is important to introduce our students to other styles of music so they can make their own decision on what type of music they most enjoy playing. Age groups for piano/keyboard lesson are from 7 year olds to adults. Beginner adults are most welcome. It is never to late to start learning a musical instrument. Please visit the Forms tab for enrolment details.